Readers wanting to catch up on MUDMAN, Paul Grist’s unique take on the superhero, will now get their chance. The first two issues of a story Grist describes as â“all about growing up and finding your way in the world, and how the decisions that you make can affect othersâ€ sold out. But now new printings of MUDMAN #1 (DEC118139) and MUDMAN #2 (DEC118140) will be available at the same time MUDMAN #3 (NOV110463) hits the stands on Wednesday, February 14. 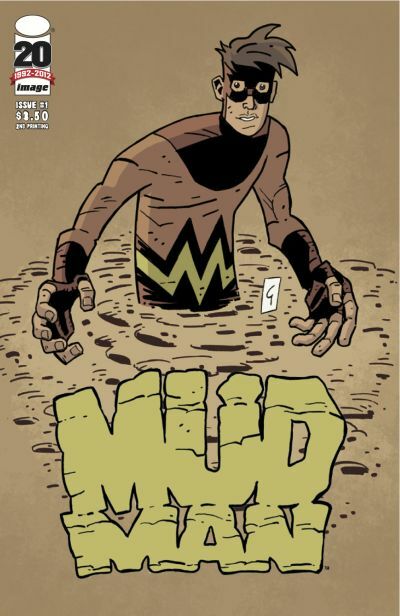 In addition, MUDMAN #1’s second printing will feature a brand new cover by Grist and the cover of MUDMAN #2 will have new coloring. Like the hero of Grist’s beloved series JACK STAFF, MUDMAN’s Owen Craig is a distinctly British superhero, but in an entirely different way. An unsure teen in an English seaside town, Owen discovers that he’s different. His body is turning to mud, and he must learn to control it before he gets stuck in his tiny hometown in a way he never anticipated. MUDMAN is a full-color comic book series that reviewers have called â“free of manufactured angst,â€ â“great funâ€ and â“not to be missed.â€ It is released monthly, for $3.50 per issue, and is also available through digital platforms.